Until 30 June 2018, Beha-Amprobe is offering a complete set of Light-Check adapters free to purchasers of a ProInstall-75-UK multifunction installation tester. They are available together as a Proinstall-UK kit (Order No: 4980688) for fast, easy testing. The ProInstall-75 is designed to be the perfect installation testing tool for verifying the safety of electrical installations in domestic, commercial, and industrial applications. The five Light-Check adapters offer safe testing of all standard light points. The Beha-Amprobe ProInstall-75 multifunction installation tester ensures that fixed wiring is correctly installed and compliant with IEC 60364, HD 384 requirements and all relevant local standards, including BS 7671 17th Edition wiring regulations. It is efficient to use, as it allows the user to measure loop impedance without tripping RCDs, eliminating the need to bypass them. Slim reach probes allow the user to keep their eyes on the panel while probing hard-to-reach areas. With easy-to-operate controls, a large display with a wide viewing angle, padded neck strap, and a compact, lightweight, ergonomic design, the tester is comfortable to use for all day testing. The Beha-Amprobe ProInstall-75-UK features a dual display, providing simultaneous readout of mains voltage and frequency. It offers advanced loop testing which prevents RCDs from tripping, and a fast high-current loop test for circuits with no RCDs. There is a PASS/FAIL indication for RCD test results, and a variable RCD current mode for customised settings. It also provides an indication of phase sequence. The ProInstall-75-UK is designed to measure AC voltage, insulation resistance, and loop and line impedance, as well as carrying out PEFC/PSC testing and continuity testing. Voltage measurement can be selected quickly and easily between L-N, L-PE and N-PE. A zero adapter ensures easy, reliable and accurate test lead compensation, while an auto-null feature subtracts lead resistance from measurements, storing it in memory even after powering down. 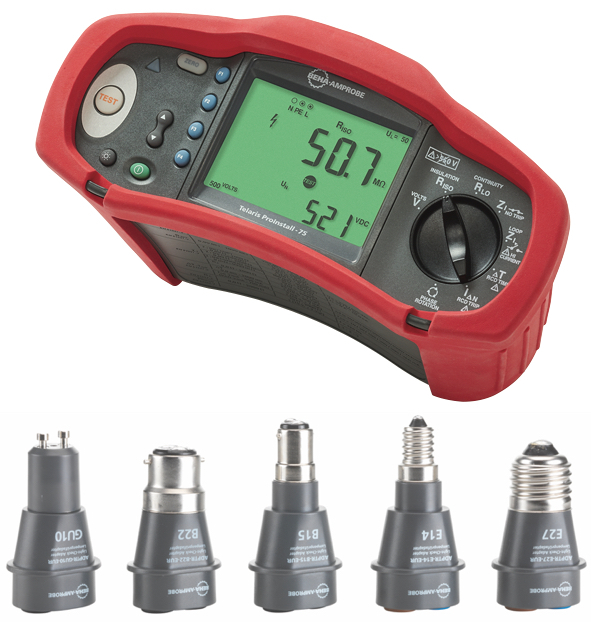 The Beha-Amprobe Light-Check adapters can be used in conjunction with a wide variety of test equipment that uses test leads terminating in 4mm safety connectors. The adapters enable a range of tests to be conducted on light-fitting terminals and ensure a good, reliable and safe contact, eliminating the need to hold test probes in place. For more information on the Beha-Amprobe ProInstall-UK kits, other Beha-Amprobe test and measurement products, or to download a catalogue, visit the website.